This week it’s Diane Bentham who took part in The proto-col Chilly 10k with us. ‘As a 55-year-old blind woman I never dreamt that I could become a runner until I joined “VI runners Bristol“. 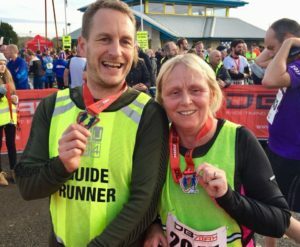 This is a group set up by Colin Johnson, he has organised a team of guides to train and run with visually impaired people. I joined the group in May 2017 and I have completed 4 Park runs and the Castle Combe chilly 10k. I love running and if I can do it anyone can’.